I had a chance to have a tour of the Toronto Internet Exchange, also known as the TorIX, at 151 Front Street West thanks to Board Director and current TorIX President Jon Nistor last Friday, January 20th, 2012. Interestingly, Jon started his involvement with the TorIX when he was working way back with Primus Canada about ten years ago, which is where I am currently working. Now, what is the TorIX exactly? It was first started within the RACO facility about twelve years ago in 1999. After a few years, it was then within Switch and Data, and currently it is within Equinix. The TorIX, using a three-switch design, is located in three areas at 151 Front – two are in the Equinix colocation and one is in the Cologix colocation. 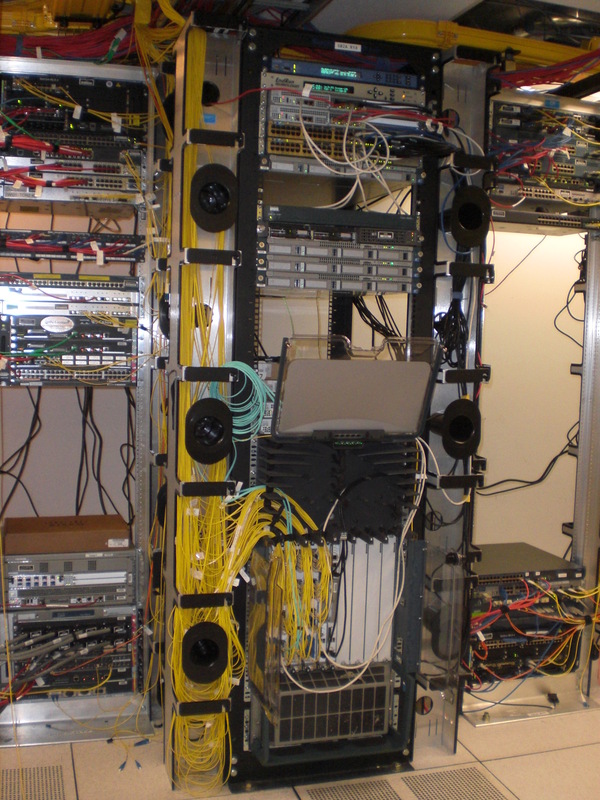 The two (of the 7 or 8) Equinix areas being used are on the 7th floor, and Cologix is in the 6th floor where the core equipment and the main TorIX switch Cisco Nexus 7000 are located. Some TorIX members have their own colocation facility within 151 Front, others colocate in the Equinix facility within 151 Front, and others are located outside of 151 Front. The bigger Equinix room on the 7th floor has about 8 to 9 peers there. In the smaller Equinix room, you will find the PRI switch there and some other peers. Teleglobe, who acts as a carrier for some peers like from Netherlands or Italy, and another carrier Level 3 (formerly Global Crossing) also colocates in that room. Some of those that colocate in the Equinix facility do not necessarily have their actual servers in the location; it is only their transport equipment and multiplexers there, like for example Google, as they have their own data centre somewhere else. CBC and Toronto Hydro are examples of some peers that are located outside 151 Front. Peering at the TorIX would be cheaper than having to peer directly with each of the ISPs or hosting companies. The cost involved in peering at the TorIX only includes the cost incurred with a peering member’s telco provider, and the last mile connection between the member’s facility and the switch (install + yearly fee). This could be $1,200/year for some smaller company peers, or be something like $60,000/year for peers that want more bandwidth or faster speed. This would be tons cheaper as you would have the opportunity to get connected with many peers through this Internet Exchange. TorIX members can choose whomever they want to peer with, and configure their own equipment to establish the peering sessions. On the other hand, there are also some others that just use the routeservers if they want to get all routes without individually setting up peering with the TorIX members. This wouldn’t really be all routes, but more like 80% of the routes. For ten years, the TorIX has been using donated equipment, but now all the equipment are purchased with support contracts – just in case anything doesn’t work as it should, or needs replacement parts. Speaking of which, thanks go out to Jon for giving me a Cisco Catalyst 3524 switch from the spare stock pile, which led me to decide to get my own equipment for my home lab to practice with. I really need to get going in pursuing my Cisco certifications. The TorIX currently has 7 Board of Directors and 3 Operations persons who all help run the ToriX in a volunteer capacity. Volunteering with TorIX would be great, in my opinion, so I would want to help out in some way, as it would be a good learning experience as well. They have monthly meetings, take part in conferences, have projects from time to time (like the current NTP server project with CIRA), and others. This entry was posted in Cisco, Tech. Someone mentioned to me today how it’s amazing that my interest involves two opposite sides of the spectrum. We were talking about how I am into the I.T./technology field AND the performing arts. I don’t think I have mentioned it here yet before in this blog, though I know that some of my friends do know these two sides of me. Actually, there can be a lot of sides to me. I am unique. I am simple, but also complicated. I know that I’m not the only person who is like this though. Well, it’s different living in this side of the world, because not a lot of people are like me in the sense of interests – so some people can be surprised to hear what I do. FYI, dear people – this is not uncommon if you grew up in Asia. These are just some thoughts that come to mind on this Wednesday night after a long day of some ‘performing arts’ stuff. Back to regular programming soon on this blog.